Kim 365 · Everyday life. Messy stuff included. Everyday life. Messy stuff included. I thought I’d share another muffin recipe. 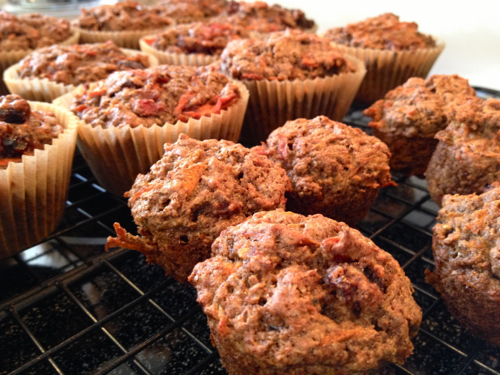 These are adapted from a recipe I got from my sister Jude, as most of my muffin recipes are. She is a master at packing heaps of goodness into every bite. Originally they had a lot of bran in them, but that seems to go straight through my toddlers so I have scaled back on the bran. Fold wet ingredients into dry, and bake at 375F for 20 minutes. Well the new year is upon us, and we all know what that means. It’s time to get serious about everything. You ran 5K last year? This is your year for a marathon! You used your credit card too much last year? Time to snowball that debt and take charge of your money! You bought too much food through a window? Time to start cooking at home! No, these are not my resolutions. Well, not all of them. I will let you guess which, if any, are true. I baked muffins yesterday. 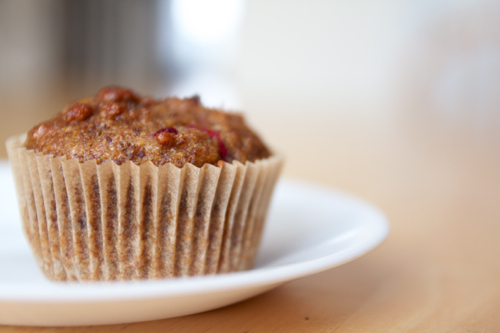 Wholesome, honest-to-goodness good-for-you muffins. Because it’s 2013. And because I made a resolution to eat more vegetables. Vegetables in muffins? Oh yes! This recipe comes to you courtesy of a bunch of different recipes mashed together. I am always foggy on giving credit for recipes. If I take a Jamie Oliver dish, change one ingredient, do I get to call it my own? Apparently I technically do. I don’t get it. These are not Jamie Oliver’s muffins, for the record. They are (sort-of) my own brilliant concoction. The beets I used were a treasure I discovered in my freezer, leftover from the summer. You could swap 2 grated apples. Swap some different dried fruit. Throw in some nuts. Go crazy! Stir with a whisk to combine. Blend together, and combine with veggie concoction. Fold the wet ingredients into the dry and bake at 375F for 20 minutes. This yielded me 12 regular sized muffins and 27 mini muffins. Sorry it doesn’t make a normal, even amount. That always annoys me. I’ll just say it should make 12 regular and 24 mini. That’s better.